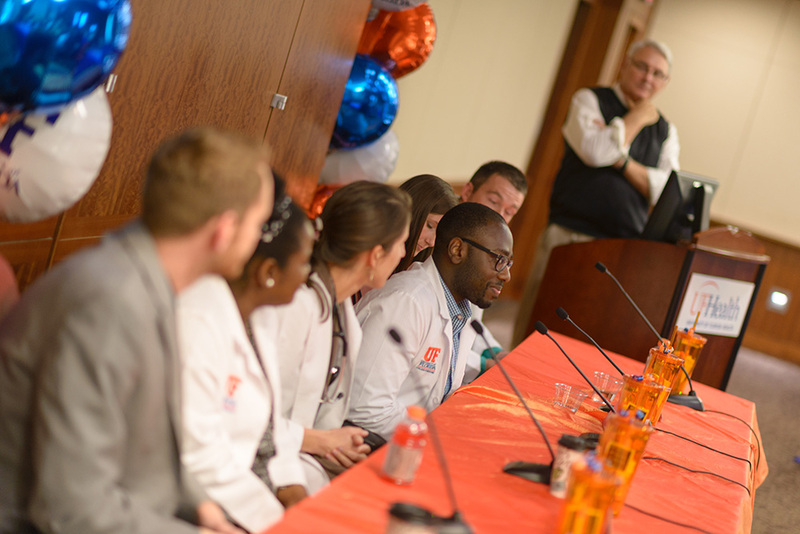 UF College of Medicine and UF School of Physician Assistant Studies alumni mingled not only with each other, but also with current medical and PA students during the UF College of Medicine Alumni Weekend Nov. 14-16. To connect the past and present, two PA students and four medical students shared their educational experiences with alumni during a student panel on Friday afternoon. Third-year medical student Lexi McBride Crawford shared how one of her favorite parts of medical school is the “early exposure to patient care we’ve been getting.” She said that this early interaction with patients has helped medical students on the wards to be more successful and helpful to residents. 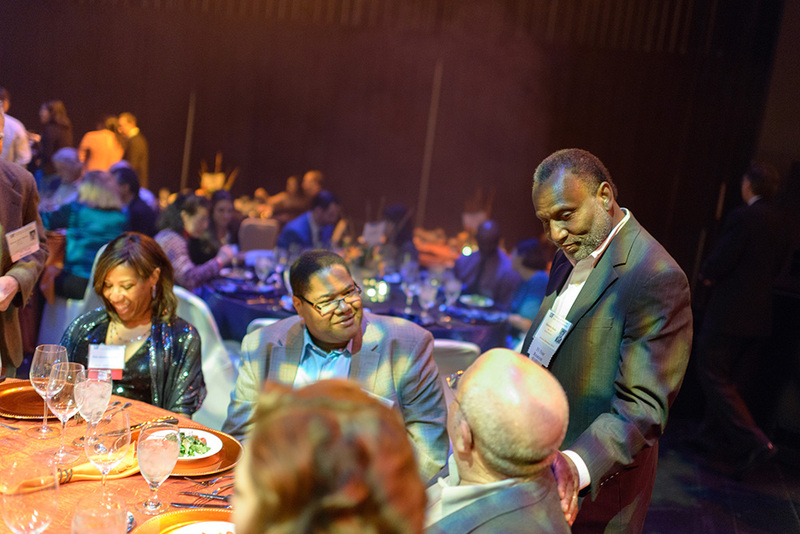 More than 200 UF College of Medicine and UF School of Physician Assistant Studies alumni spent the weekend reminiscing and reconnecting during alumni weekend. 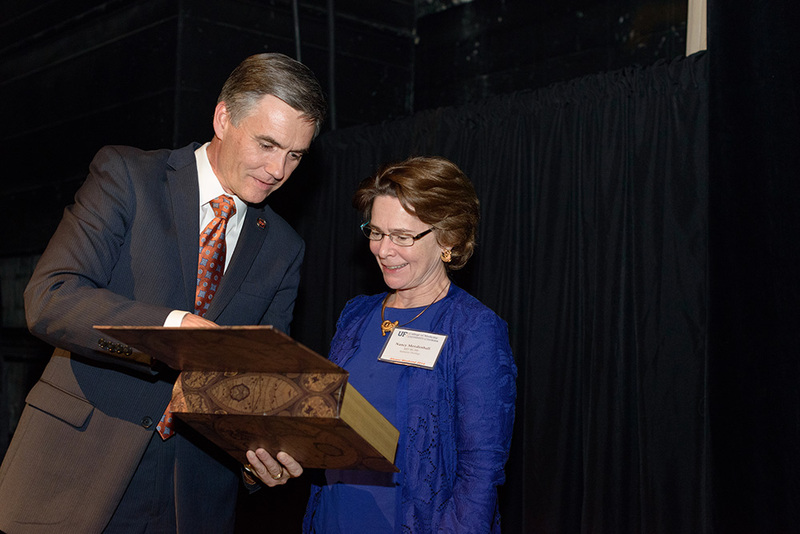 “It’s wonderful to learn about the accomplishments of our alumni, as we now have about 4,400 from the 54 years of the College of Medicine,” said Michael Good, M.D., dean of the UF College of Medicine, during the Reunion Classes Celebration Friday night. The reunion medical classes of 1964, 1969, 1974, 1979, 1984, 1989, 1994, 1999, 2004 and 2009, as well as PA classes of 1979, 1984, 1989, 1994, 1999, 2004 and 2009, celebrated during a dinner at the Curtis M. Phillips Center for the Performing Arts. After Gina Sevigny, M.D. ’94, president of the UF Medical Alumni Board, welcomed alumni to Gainesville, Good awarded Robert Phillips, M.D. ’95, with the Dean’s Distinguished Award for Excellence. Good also congratulated Nancy Mendenhall, M.D. ’80, medical director for the UF Proton Therapy Institute in Jacksonville, Florida, and R. Donna M. Baytop, M.D. ’76, corporate medical director for Solar Turbines Inc., for the addition of their names to the UF College of Medicine Wall of Fame. UF professor emeritus Parker Small Jr., M.D., was awarded an honorary degree from UF and made an honorary alumni. “He’s a Gator at heart, and now he’s officially a Gator with diploma,” said Good after listing Small’s accomplishments as a pediatrician, immunologist and educator and dedication to the medical school. On Friday afternoon, alumni toured the UF Institute on Aging or a tour representing the past, present and future of the medical school before attending the student panel. The student-alumni interaction continued during the Student-Alumni Speed Networking event Saturday morning before the pre-game tailgate for the UF versus South Carolina football game. Alumni took their seats, and students rotated every five minutes to discuss medical experiences, specialties and other things in common. Phillips, who was also the notable alumnus lecturer on Friday afternoon, enjoyed that the networking event allowed alumni to see students at different stages in their careers. The weekend wrapped up with a Sunday-morning breakfast with the deans and faculty of the UF College of Medicine and UF School of Physician Assistant Studies. For more photos, visit the UF College of Medicine Alumni and Friends Facebook page.